PM is pushing for trainee nurses to be treated as probationary employees who are guaranteed minimum wages and other benefits plus the opportunity to become regular nurses after the maximum of six months temporary status. “It is a triple whammy on young nurses to pay tuition fees while studying, then be denied a wage while working as a trainee and further be charged an exorbitant fee,” Magtubo asserted. “More than a hundred thousand registered nurses are unemployed and anywhere from 20,000 to 40,000 more will be added when the next batch of nurses graduates in April. The problem of nurses who are unemployed, underemployed & abused is reaching crisis proportions and resulting in abuses like OJT fees. Meanwhile nurses who are employed are overworked but utterly underpaid. This calls for protection by the government,” Magtubo explained. “Regulating the number of nursing schools and students are just a partial solution to the problem. Nursing schools must have the facilities to train nurses on the job and as part of the curriculum to be accredited by the CHED. 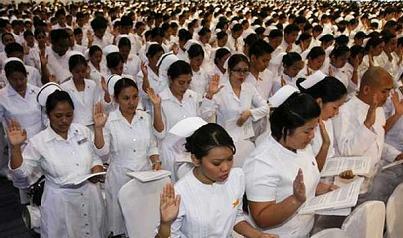 And then the DOLE must oversee the working conditions of trainee nurses in hospitals,” Magtubo insisted.